Off you go! We keep going. Our babies grow up so fast and cost now 11,90€ per wallet. At this point we would like to thank you! All of you, you have purchased a wallet until this day, and therefore supported Artyvects, made it possible for us to produce, in collaboration with four awesome designers, a new kicking collection! 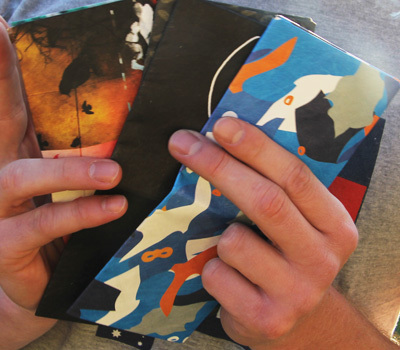 Ever since Addi introduced us to the material Tyvek and we produced the first prototypes with our own designs, we have been passionate about our wallets! After we organised and planned the start-up in the beginning, we calculated the prices. We wanted to make everything as fair and uncomplicated as possible, so that right after the product launch every new buyer could profit from the fast handling and flat hierarchies and therefore pay less. The end result of the initial price calculation was a price of 9,90 € per wallet. The price aimed at the Early Adopters and Influencers in order to get a nice kick off! And indeed, we did have a great start! We have been sending our wallets all around the world and have received really nice feedback. Meanwhile Artyvects has become a full-time job. In order to follow this path, we increase the wallet price by 2€. All 8 designs are now available for 11,90€ per model, which is still below the prices of the competition. With the increasing demand we want to be able to offer you new designs on a regular basis. So far, we invested all earnings 1:1 in prints. With the price increase we hope to provide you even faster with new and fresh designs! Of course we still don’t charge you for orders of at least 2 wallets or more. As many of our birdies that flew across boarders, got lost, we decided to insure all wallets that leave Germany. Therefore the shipping costs for deliveries abroad increased from 3,50€ up to 5,50€. The shipping costs for deliveries within Germany are still 1,45€ or its free when you order at least two wallets.